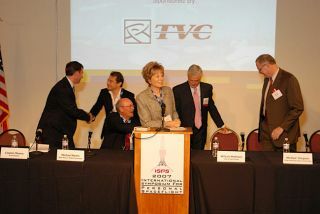 A panel of speakers at the 2007 International Symposium for Personal Spaceflight (ISPS). Speakers included Pat Hynes, Robert Dickman, Clayton Mowry, Michael Martin, William Mattiace, Michael Simpson and Peter Diamandis. LAS CRUCES, N.M. – The business of commercial space travel is now far morethan a promissory note – but significant challenges and dedicated work areahead in shaping passenger spaceflight as profitable venture. Experts outlined the coming years inpublic space travel, speaking here at the 2007 InternationalSymposium for Personal Spaceflight (ISPS), highlighted by the theme: "Progressand Next Steps." "Back in the 80s, when we weregetting going ? we were new guys on the block trying to establish a foothold inbusiness," said Clayton Mowry, President ofArianespace, Inc., with responsibility for managing Arianespace's customer,industry and governmental relations as the company's U.S. affiliate. "Alot of people were questioning our business structure ? how we were going to makemoney. But here we are today, over a billion dollar a year enterprise," hesaid. Arianespace is the title sponsor ofISPS 2007 and has over 170 launches to its credit, Mowry noted. "We were astartup once," he added. Mowry said that Arianespace sees thepersonal spaceflight sector as a new and exciting business. "We're here tokick the tires and see what's out there." The suborbital market place isprobably a stepping stone to larger markets out there, Mowry said. Not far from the symposium site, SpaceportAmerica is to be planted in New Mexico. Construction of the spaceport isbeing plotted out, said William Mattiace, Mayor of the City of Las Cruces. He projected that the southern part of New Mexico expects to a "big, bigplayer" not only in space industry but also in high tech research anddevelopment. Mattiace said that the expectationis that many companies – both old and new arrivals – can add to turning dreaminto reality regarding commercial space operations. Michael Simpson, President of the International Space University, contrasted "old space" with "new space".He explained that "accidents will happen" – in the pursuit of avibrant personal spaceflight business. "When human beings have donethings important in their history, they have found that there were prices topay," Simpson said. "We owe a lot to 'old space', and one of thethings that we owe old space is to make sure that 'new space' builds somethingthat the next new space can look back on and say, 'yes, that was a goodfoundation.'" "Space is a business,"Simpson suggested, looking out into the audience. "This is a world marketyou're knocking on." Some of that market will be based onsuborbital and orbital flight, Simpson said. "Some of it is going to bethe ability to democratize access to scientific experiments in space ? theability to fly payloads that would otherwise wait 10 or 20 years for agovernment ride," he said. Simpson said that there are a lot ofopportunities out there, "and there are new opportunities being thought ofall the time." The next 50 years of personalspaceflight will take human society into space, Simpson concluded. "That'svery good news for those of us who weren't built in the shape of a fighterpilot." The key action item now is to createan economic engine behind personal space travel, said Peter Diamandis, ChiefExecutive Officer of the XPrize Foundation. "That's what we're trying to shoot for. We're notthere yet. We are in this very critical phase that, if we stop ? it stops." Something akin for space that'srequired, Diamandis said, is an "exothermic-economic reaction. We're notthere yet, but given that situation, it's not stoppable."